Our children’s program is fun and engaging. Children fall in love with Aikido with their first free introductory class. As they gain in skills, so do they grow in self awareness and confidence. Parents often report that children practice their Aikido moves at home and begin teaching younger siblings. 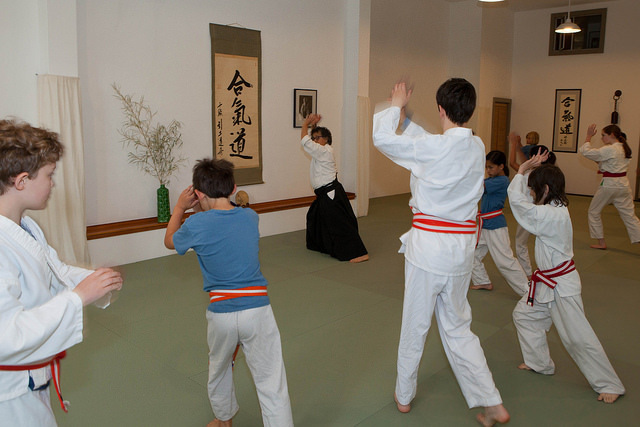 Kids discover the joy of non competitive activity as they begin Aikido classes. The win-win principles of blending with aggressive energy and genuine connection with others are taught through imaginative games and activities. Our philosophy of teaching is to blend with kids at their skill level and always provide positive feedback and encouragement. This class is focused on continuing skills and is open to new students in that age range. More attention is paid to the details of footwork, falling and technique. As students continue to progress, they are introduced to the wooden staff and sword. In this practice they discover the origins of techniques as they deepen their basic skills. This class is for children who have attained the rank of 9th Kyu, solid orange belt and teenagers new or experienced. While basics are always reinforced, advanced training themes like multiple attackers and weapon training are explored. From this class many of our teen students continue on into adult training. Younger students must have Sensei's permission to attend this class. The focus of this class is to put together a demonstration of Aikido that features both open hand and weapons training. Participants practice synchronized movements, falling and techniques. Students also get the opportunity to collaborate on the process of putting together a demonstration of the art. Working on unison with others helps to deepen qualities needed for advanced Aikido. Which Class Should My Child Start In? All the classes are mixed level and arranged by ages. New students are welcome in all sections for their age except the demo team class. There is an overlap for 9 year olds and it is recommended that you decided based on your child’s physical experience and comfort level with new activities. As older children often pick up physical skills more quickly they are given the option of joining either section. Teenagers new to Aikido are more comfortable starting out in a class with peers who have experience than with younger aged new students. They usually pick up basic skills and integrate into training at that level quickly. Depending on their physical and emotional maturity, older teens may want to explore the adult classes. Some of our teens train in both the teen and adult classes. It is recommended that your teen observe and try out both sections. How Many Times a Week Should Kids Come? The schedule is set up to allow kids ages 6 and above to come three to four times a week. Most kids attend somewhere between 1 and 3 times a week based on their schedules. Kids do make progress coming once a week, although it may take longer to move from rank to rank. Since Aikido emphasizes non competition, each child is encouraged to perform to the best of their ability. Loose fitting and comfortable clothing, play clothes are all that is required to try out or start a class. We practice bare foot on mats so shorts are not recommended. Students practice in a traditional uniform or gi, which are discounted for all new students. School t-shirts are also available. Students can wear the traditional uniform or gi pants and a school t-shirt. As students move through the ranking system they are asked to demonstrate all 3 levels with each rank. Form and movement and falling and knee walking skills are marked by a strip of colored tape placed on their belt. With technique demonstrations students are promoted to a kyu rank level and also receive a colored belt and a certificate. Children like and appreciate structure. Our children’s program breaks down skills and offers kids the opportunity to deepen those skills at each level. Friend and family are always welcome to witness their rank test where they will amaze you with graceful, sensitive and sophisticated movements. Children can come try a free class during any class in their age range.